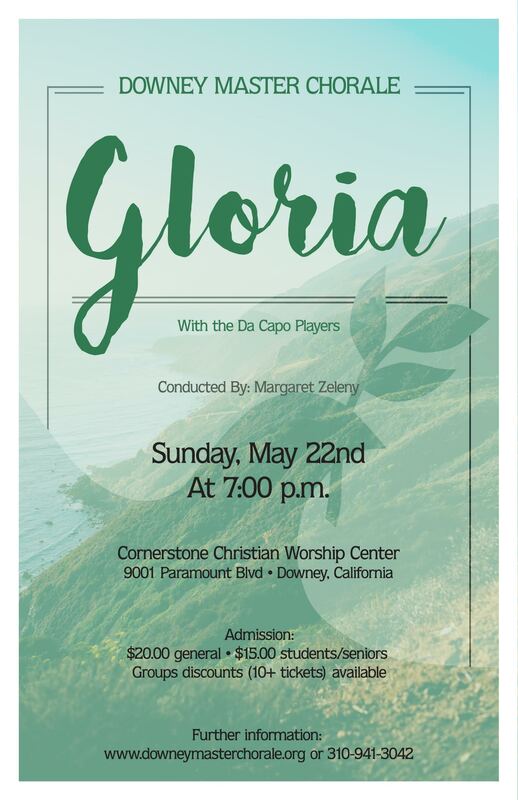 For their Spring Concert, Downey Master Chorale will present the youthful, brilliant, often deeply spiritual GLORIA by Antonia Vivaldi. Featured in this program will be the Da Capo Players from Costa Mesa, this is to complement the voices and enhance the pleasure of the listeners. Rounding out the program will be masterpieces by G. F. Handel, Gabriel Fauré, Randall Thompson, John Rutter and Rodgers and Hammerstein. A dessert reception will follow the concert. Come with the whole family. This is an ideal opportunity to introduce your children to classical music. for more information. We are also seeking sponsors and financial supporters for the concert. If you would like your business featured in the program, or can help us fulfill our mission to bring classical choral music to this community, please call (310) 941-3042.